dir. Ti West | USA | 2011 | 102 mins. Ti West’s third feature—after The Roost; 2009’s stunning ’80s-horror homage The House of the Devil, and a director-for-hire gig helming the second in the gross-out teen-gore Cabin Fever franchise, Cabin Fever 2:Spring Fever—is a haunted-hotel movie that immediately invites comparisons to The Shining. 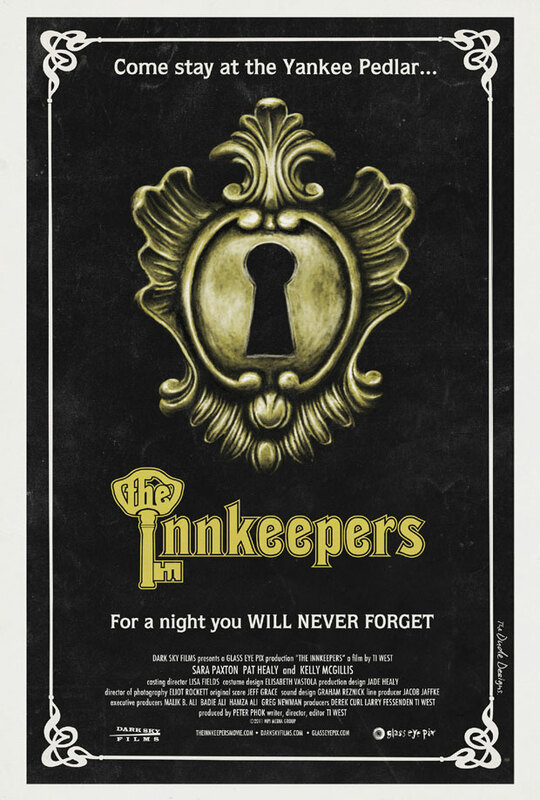 After it overcomes some early jitters, The Innkeepers is successful in creating an eerie atmosphere on a low budget while also delivering some deadpan jokes along the way. Like The House of the Devil—which focussed on just two characters and starred mumblecore darling Greta Gerwig—West’s new film is centred on just a few characters, and has a pretty blonde protagonist. The entire third floor is already closed off—all the rooms are stripped of furniture—and there’s only one guest: a middle aged woman and her young son. Then, a 50-something former actress turned psychic—played by an almost unrecognisable Kelly McGillis—comes to stay the weekend. Alternately affable and rude, she progressively becomes a larger part of the story—as does an old man who comes to reminisce about the night he and his young bride spent in the hotel’s honeymoon suite. The initially uneasy chemistry between the two leads slowly becomes more fluid and natural, improving as the film becomes more intense—and the comedy peppered throughout the film’s first act balloons into something more significant, too. Some of the early laughs come simply from the film’s flimsy construction: there are lines near the start that are almost Wiseau-esque; but, again, this gives way to building tension and helps Paxton and Healy delve more deeply into the Claire and Luke’s relationship. There are a few scares in unexpected places—not just pacing-wise, but visually too, thanks to the ingenious use of a few carefully-placed dutch angles—but West’s great gift here (as in House) is for creating an involving, almost unbearable tension on a modest budget. The sound design is striking, and the low-fi visual aesthetic—which thankfully doesn’t resort to the found-footage/cctv tactics of flaccid mockumentaries like the Paranormal Activity franchise—rather than being distractingly cheap-looking, works in direct service of the story. The film’s awesome posters, incidentally, denote something of the retro ’70s vibe West achieves on screen, particularly in a brilliant Coppola-esque crane shot in the penultimate scene. The New Zealand International Film Festivals began on July 14 in Auckland; they start in Wellington on July 29, then travel to Dunedin, Christchurch, Palmerston North, and Hamilton throughout August, and Nelson, Tauranga, New Plymouth, Hawke’s Bay, Greymouth, Masterton, and, finally, Kerikeri in November. Full information on all films in the programme is at the festival’s website. For more reviews, browse the “New Zealand International Film Festivals 2011” tag on this site, and check the Twitter hashtag #nzff.